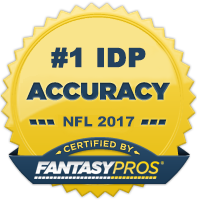 Hello and welcome to the second part of a three part series covering IDP average draft positions (ADPs). This article will compare the ADP of Defensive Linemen (provided by My Fantasy League) to my Redraft Rankings for Defensive Linemen. Keep in mind that some IDP leagues reward more heavily for big plays and therefore pass-rushing specialists such as Chris Clemons, Brian Robison, John Abraham, etc. may have a higher than expected ADP than if they were selected in tackle-heavy or balanced leagues. Conversely, players such as Haloti Ngata and Ahtyba Rubin may have a higher than expected ADP in tackle-heavy leagues. Also, the ADP of defensive tackles and rookies may be slightly inflated due to the incorporation of DT-required and rookie-only IDP drafts into MFL's overall draft position numbers. I hope this helps my readers get a better grasp on where defensive linemen should be taken in most leagues and that it will ultimately take you one step closer to your league championship. LDE Osi Umenyiora (NYG) - Being a New York Giant has hurt Umenyiora's perceived fantasy value so far this off-season. On average, teammates Jason Pierre-Paul and Justin Tuck are currently being selected in the top 5 at this position whereas Osi is being selected several rounds later. Although Umenyiora is technically not a "starter", he will rotate in enough throughout the game to be on par with many other league starters from a snap count basis. In the 9 games in which he played last year, he put up 10 top DL numbers and has averaged over 8 sacks a year since 2004. He signed a one year contract extension this off-season and will be playing at 120% to earn a new contract (likely with a new team). Umenyiora deserves to be a top 15, if not a top 12 selection this season. LDE Kamerion Wimbley (TEN) - Wimbley's slip in draft position is likely due to two factors: First, he played and was classified as a linebacker since entering the league in 2006 and although he put up respectable numbers, he didn't warrant roster consideration in most leagues. Second, he played on two lower profile teams in the Browns and Raiders. This year is a different story, however. He signed with the Titans in the off-season who have a good track history of coaching up solid fantasy defensive linemen and he has a talented young defensive end in Derrick Morgan playing opposite him. Expect DL2- production. RDE Greg Hardy (CAR) - Hardy, a 6th round draft pick out of Mississippi, became one of the better early season waiver wire pickups last year. But after a hot start, his production waned and he only registered 1 sack in his last 11 contests leading many owners to drop him and write him off as a flash in a pan. Though if you look closer, this thinking may be incorrect. Yes, Hardy's play dropped off significantly down the stretch, but not due to lack of talent. Rather due to lack of endurance. Hardy's gained 30 pounds of muscle over the off-season which should help keep him stronger over the course of an entire season and at age 23, he's only going to get better. LDE Mark Anderson (BUF) - With all the excitement surrounding the Bills signing Mario Williams and his subsequent return to defensive end, the potential fantasy value of recently-signed free agent Mark Anderson has gone relatively unnoticed. Here's a player that's proven he has upper echilon pass-rushing ability at various points throughout his career (12.5 sacks in 2006 and 9.5 in 2011). However, he's never been entrusted with an every down role like he will be in Buffalo. Being on the field in this capacity should really help his tackle numbers and make him a likely candidate for DL3+ or higher production this season. RDE Darnell Dockett (ARI) - Dockett was, not too long ago, a consensus top 15-20 selection at his position. However, the emergence of teammate Calais Campbell has taken much of the shine off of Dockett's fantasy value. Granted, he's not the type of player that's going to dominate games and provide you with huge fantasy weeks, but he's consistent and has been for several years. As teams begin to focus more on Campbell, I expect there to be a slight share shift of production back towards Dockett and wouldn't be surprised to see him finish in the top 25-30 range. RDE J.J. Watt (HOU) - Watt had a great rookie season and one of the more impressive playoff performances for a defensive lineman in recent memory. But, his current ADP is too high. He's not a top 10 fantasy DL. He finished outside the top 20 in most balanced and big play scoring systems last year and being a 3-4 DE means he has a shorter ceiling than other linemen with similar ADPs. I wouldn't fault someone for taking him as their DL2, but he shouldn't be counted on for DL1 production except for in the most tackle-heavy of leagues. RDT Ndamukong Suh (DET) - In just two short seasons, Suh has managed to become one of the more recognizable defensive players in the NFL and this recognition has caused him to be overvalued by the fantasy public. With IDP Fantasy Football still being somewhat "niche" within the industry, even experienced fantasy players tend to draft defensive players based off name and not actual research/rationale. Suh's point production last season was down over 50% year over year and he wound up on many redraft league waiver wires by mid-season. I'm not suggesting that Suh's numbers will be as bad as they were last season, but the chances of him replicating his 2010 season are low. You're better off letting someone else take a chance on him that early in the draft. LDE Bruce Irvin (SEA), LDE Courtney Upshaw (BAL), & Quinton Coples (NYJ) - I suspect that the ADP of these three rookies may be a bit inflated in part to rookie-only IDP drafts being factored into MFL's overall draft position numbers. With that said, you should still be wary of drafting these players too soon. Irvin is an explosive first step player who could reach double digit sacks this season, but he's not gonna see enough looks against the run to warrant top 30-35 selection except in leagues that reward quite heavily for sacks. Upshaw was a great college talent, but even the best of talents take time to develop at the defensive end position in the NFL especially in a scheme as complex as the Ravens. Coples is in a similar situation to Upshaw from a scheme perspective and comes with the same types of draft caveats. All three players project as potentially great long-term, dynasty players, but I typically don't make a habit of drafting rookie linemen as anything more than DL4s for the first year unless the situation is prime for fantasy production (e.g. Jabaal Sheard). LDT Nick Fairley (DET) - Honestly, I'm not sure why Fairley is being drafted so high. He managed just 17 total tackles and 1 sack as a rookie last season and has been arrested twice so far this off-season meaning he'll likely be suspended for at least 1 regular season game. Additionally, there are a lot of people vying for fantasy points within the Lions front seven (Cliff Avril, KVB, Suh, Tulloch, Levy, Durant). I have no interest in taking a flyer on Fairley ahead of guys like Derrick Morgan or Greg Hardy. NT B.J. Raji (GB) & RDT Cullen Jenkins (PHI) - Let me preface by saying that the ADPs of these defensive tackles may be skewed a bit to the higher end due to DT-required leagues being incorporated into the overall ADP results. With that said, these players are still being overvalued. Raji has been virtually irrelevant from a fantasy perspective in two of his three seasons in the league and Jenkins is due for a reduction in playing time with the arrival of rookie Fletcher Cox. As you can read in my 2012 Defensive Tackle Rankings, there are several other tackles worth taking over these two that can be had much later in drafts.